As a child, I traveled a great deal with my parents, mostly to Europe and the Middle East. Whenever we arrived at our destination, the first thing my mother did was take my brother and I to the local pharmacy (or pharmacie). Whether we were in Tel Aviv, Paris, Berlin or Florence, somehow my mother always knew which pharmacy was the best. These outings felt like an adventure: The pharmacies overseas were different from those in New York City. They were fancy and old world and I loved them. For some reason these exotic toothpaste brands were the only solution that relieved my hairy-feeling teeth blues. Not literally hairy of course, but hairy meaning not squeaky-clean feeling. And each brand had its own specialty. Elgydium, from France, makes a whitening or Blancheur version, as well as one for sensitive teeth and gums. Elemex, from Germany, makes a sensitive formula as well but also has a special travel kit with a handy dandy put-it-together-yourself toothbrush. It is incredibly charming! Inaden hails from Greece with a uniquely minty flavor. 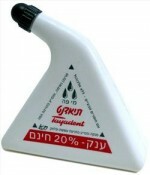 Tayadent is an Israeli brand that comes in a plastic triangle-like box…in liquid form. It suds up like soap in your mouth! You have never seen anything like it. Many Israelis make fun of me for liking this toothpaste; they would rather use Colgate or Crest. But again, this is another toothpaste that banishes that not so fresh, hairy teeth feeling. If you really want to boost the efficacy of these babies and pack an extra fresh punch, use Vine’s Negative Ion Care Water in conjunction with these brands. You won’t believe how clean your entire mouth will feel. Most full size toothpaste is actually TSA travel size. Remember any product that is 3.4 fl oz or 100 ml or less is technically travel size. Most toothpaste tubes are 75 ml or less. I guess everyone longs for exotic, harder-to-find products from overseas. The grass just always seems greener on the other side of the ocean, and if brushing my teeth with toothpaste from around the world makes me feel a little more special, well, aren’t I a lucky girl!